Close to Naples in Italy there is an old culinary art famous all over the universe: the original mozzarella cheese. It is an old tradition and a "must try" if you come here in Naples, or better in Caserta. 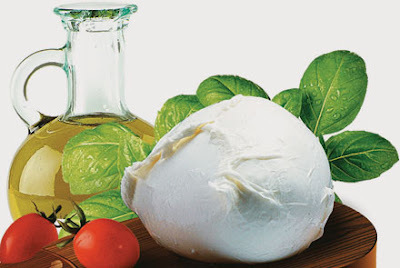 Yes, because there are different types of mozzarella, but the only ones protected from the DOP recognition are from two specific provinces in Campania region: Caserta and Salerno. Two different kind of cheese but same delicious, wonderful taste and flavor, produced only with fresh buffalo milk from Campania region. Soft and moist, very bland and milky tasting, almost spongy and oozing with milk. Thanks to the craze for Italian food, high-moisture mozzarella is more readily available in the USA than ever. There are three types: industrially produced fresh mozzarella that is available in many specialty stores, mozzarella curds that are available for delis to mix with hot water to form soft mozzarella in their stores, and some handmade fresh mozzarella that is available from company's such as ours. Fresh mozzarella can be packaged dry in vacuum-sealed plastic packages or in a governing liquid sometimes called "latte". It is available salted and unsalted. It is most often made from cow's milk; however it can be made from a combination of other milks such as cow's milk and goat's milk mixed. A small amount of buffalo-milk mozzarella is produced in the USA although very little water buffalo milk is commercially available. Most buffalo milk mozzarella sold here is imported from Italy.It is often served with tomatoes in a typical italian salad, named "Caprese" because of its origin in the little, big island of Capri. But mozzarella fits perfecty with everything. You can find mozzarella on pizza (even if there are discussions about this and variuos schools of thoughts...), in sandwiches or just...alone! Try it only with a little olive oil. If you want to taste immediately this delight, don't wast your time and book now your stay in Caserta with Leibtour.com, an online travel agency specialized in culinary trips.